Your lawn needs to breathe, just as we do. We frequently forget that plants incorporate oxygen into their life cycles, just as we do. So, whether you’re a novice gardener, or an experienced one, remember this word: aeration. Basically, it’s poking holes in your lawn so that soil that has become compacted is loosened, increasing its nooks and crannies that absorb water, air, and nutrients. Aeration also stimulates root growth, reduces water runoff, and increases the lawn’s drought tolerance, all of which improve the overall health. Soil compaction causes turf deterioration, and occurs in common situations, such as when we walk on our lawns, and when we mow them; the first 2 to 3 inches of soil suffer the most. For warm climate lawns, which are primarily made up of Bermuda grass, St. Augustine grass, Zoysia grass, and Buffalo grass, it is best to aerate in late spring or early summer. 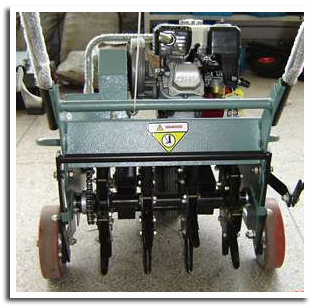 Thick lawns should be aerated on a regular basis, usually every year. If you do so, your lawn will be greener, easier to maintain, and will suffer from fewer pest problems and disease. Cool season grasses like fescue can use a spring aeration as well every other year. Now that we’ve discussed the “why” of aeration, let’s talk about the “how”. 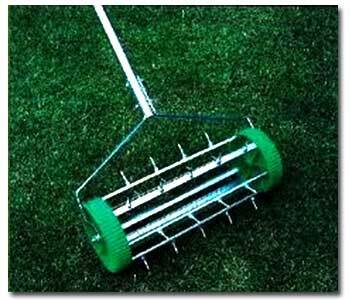 If your lawn area is manageably small, use a hand held aerator. However, this is rather labor-intensive for a normal sized lawn, so we suggest that you rent a power-driven core aerator (or aerifier) at your local rental yard. The working parts of these machines are spoon-shaped tines, or hollow tubes, and as the tubes are driven into the lawn, cores of soil are removed and strewn across the turf. Leave these cores on the grass and rain will naturally dissolve them over the course of a few weeks. If the rain isn’t present, run the sprinklers! You may also speed up their disappearance by lightly raking the cores into the lawn, first in one direction, then in a perpendicular motion. A good practice is to spread granulated gypsum and Kellogg® Topper according to package directions or Gardner & Bloome® Soil Building Conditioner after you aerate your lawn.